Are Digital X-Rays Best For Orthopedic Radiography? Recent statistics show that there are roughly 30,000 orthopedic surgeons in the U.S. This is only a small number of the greater amount of orthopedic practitioners nationwide. Because of the wide array of medical situations that can lead to bone or muscle issues, there is a great demand for orthopedics. As well, there is heavy pressure to provide the best care possible. 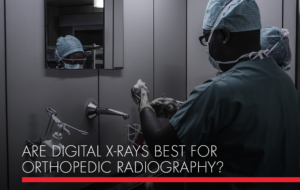 In regards to orthopedic radiography, digital x-rays may be your best asset. Here’s why. One thing to understand when it comes to orthopedic professions is that, in general, managing equipment costs can be a difficult task in and of itself. Part of working around this issue is not just clever financial management, but also getting the most ROI. Medical imaging is extremely important to orthopedic professionals because the way that a bone breaks or a muscle sprains can determine the best care possible. This can vary, even for a single muscle. This is what makes digital x-rays stand apart. The ability to get a more accurate image at a fraction of the time that it takes for other medical imaging items to do not only allows orthopedists to make diagnoses with greater accuracy, but also to process patients much faster. Digital radiography also makes it possible to superimpose images taken at different times, making it easier to track patient progression as different injuries and medical issues heal over time. Orthopedics is important for a variety of different reasons, but when it comes to radiography, the needs are similar to other medical disciplines. Digital x-rays offer more accuracy and efficiency in orthopedic radiography, two areas of extreme importance. Look to JPI Healthcare Solutions to learn what your options are in terms of implementing medical imaging solutions into your orthopedic practice.